The Cinque Terre area is an enchanting place with an untouchable beauty. The five neighboring towns Monterosso, Vernazza, Corniglia, Manarola and Riomaggiore are beautiful unspoiled fishing villages, featuring colorful pastel houses surrounded by groves of olive trees, vineyards and amazing seaside cliffs. The stunningly beautiful Cinque Terre area features olive groves and vineyards clinging to green hillsides, small charming villages perched above the Mediterranean and the clean turquoise sea. The Cinque Terre are probably one of the most beautiful coastlines to find in Europe. For the first time these isolated villages on the Mediterranean coast have been reached by the outside world a few hundred years ago, when the railway line was built. Nowadays, these villages and the National Park are protected by the UNESCO. For a wedding in the Cinque Terre (Riomaggiore, Vernazza, Manarola, Monterosso, Corniglia) there are plenty of unique reception venues from rustic Italian “trattorias”, elegant restaurants or charming private villas. With a location this amazing, we suggest a rather rustic Italian wedding theme and to let the setting speak for itself, integrating details of beautiful wedding decorations. Like all destination weddings in Italy we plan a wedding in the Cinque Terre that should involve fantastic discovery excursions and tours. The Cinque Terre are great for hiking through vineyards for wine tasting sessions, snorkeling or just relaxing in the sun – enjoying the vibrant Italian lifestyle. The perfect time for a Cinque Terre wedding is between May and the end of October, since the climate is mild and summers tend to be long and dry. Like all destination weddings we plan, we offer weddings full of activities from wine tasting sessions to city tours. For a wedding in the Cinque Terre (Five Lands) we suggest a relaxed walking to through groves of olive and lemon trees enjoying the breathtaking views and a wine tasting session. 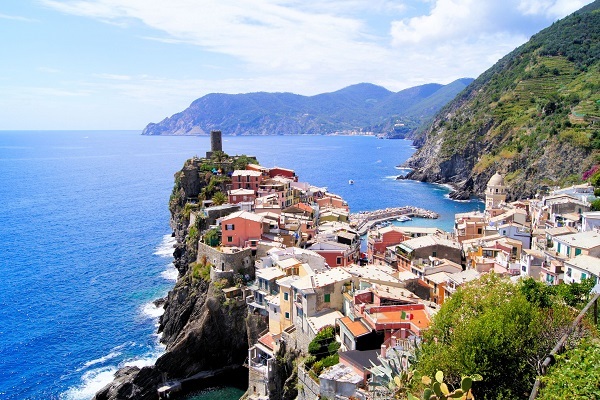 The Cinque Terre and the clear Mediterranean Sea are also great for swimming and snorkeling.